You can use replication as a scale-out solution; that is, where you want to split up the load of database queries across multiple database servers, within some reasonable limitations. Because replication works from the distribution of one master to one or more slaves, using replication for scale-out works best in an environment where you have a high number of reads and low number of writes/updates. Most websites fit into this category, where users are browsing the website, reading articles, posts, or viewing products. Updates only occur during session management, or when making a purchase or adding a comment/message to a forum. 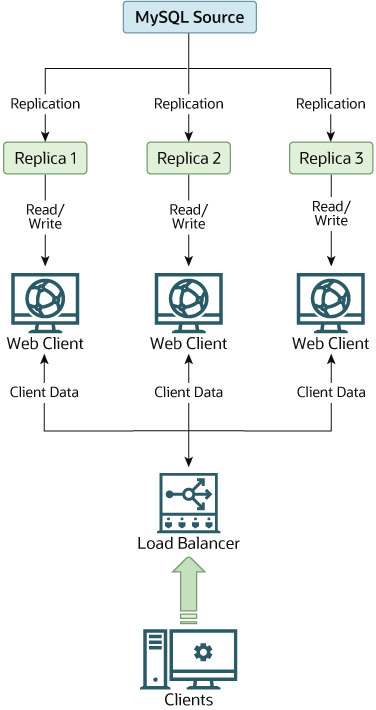 Replication in this situation enables you to distribute the reads over the replication slaves, while still enabling your web servers to communicate with the replication master when a write is required. You can see a sample replication layout for this scenario in Figure 17.1, “Using Replication to Improve Performance During Scale-Out”. safe_ in each function name means that the function takes care of handling all error conditions. You can use different names for the functions. The important thing is to have a unified interface for connecting for reads, connecting for writes, doing a read, and doing a write. Then convert your client code to use the wrapper library. This may be a painful and scary process at first, but it pays off in the long run. All applications that use the approach just described are able to take advantage of a master/slave configuration, even one involving multiple slaves. The code is much easier to maintain, and adding troubleshooting options is trivial. You need modify only one or two functions; for example, to log how long each statement took, or which statement among those issued gave you an error. If you have written a lot of code, you may want to automate the conversion task by writing a conversion script. Ideally, your code uses consistent programming style conventions. If not, then you are probably better off rewriting it anyway, or at least going through and manually regularizing it to use a consistent style.